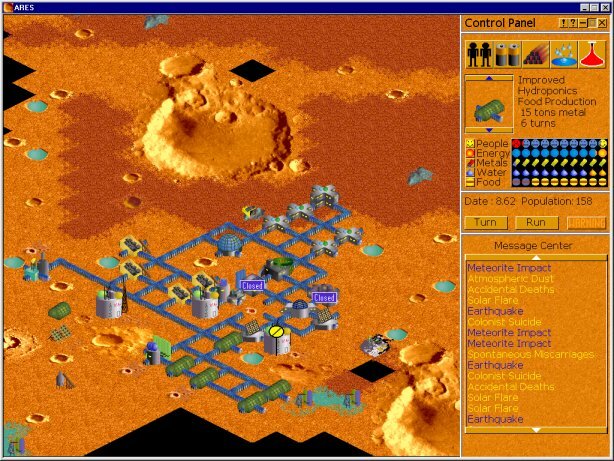 Does anyone remember a 2D Mars colony simulation game from the 1990's? It's basically a 1990s 2D version of Sol 0. I played in on Windows 98 between 1998 - 2002. The graphics look similar to this gimp reconstruction. The black squares are unexplored tiles. I think it was an indie shareware/freeware game. In the beginning of the game there is a problem with the colony ship and you must pick a spot on the planet for the habitat modules to land (4 max). 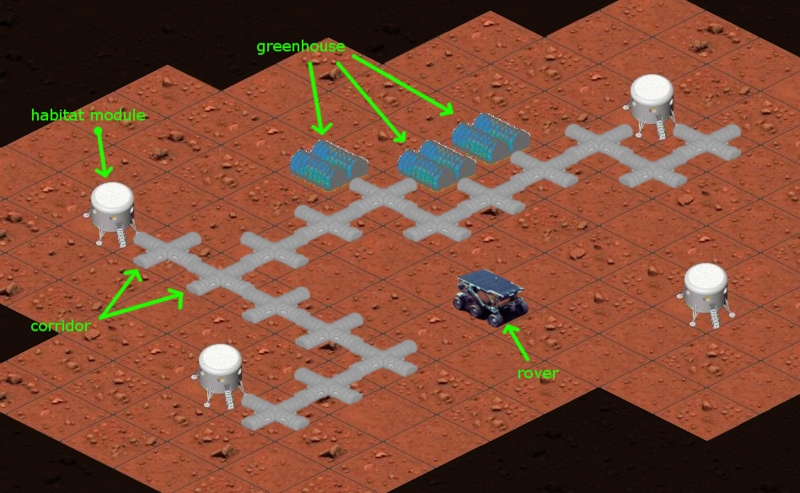 Depending on the terrain, some modules (as many as all 4) could crash. If no modules survive, game ends before you could even build a colony. Buildings must be connected by tubes/corridors. 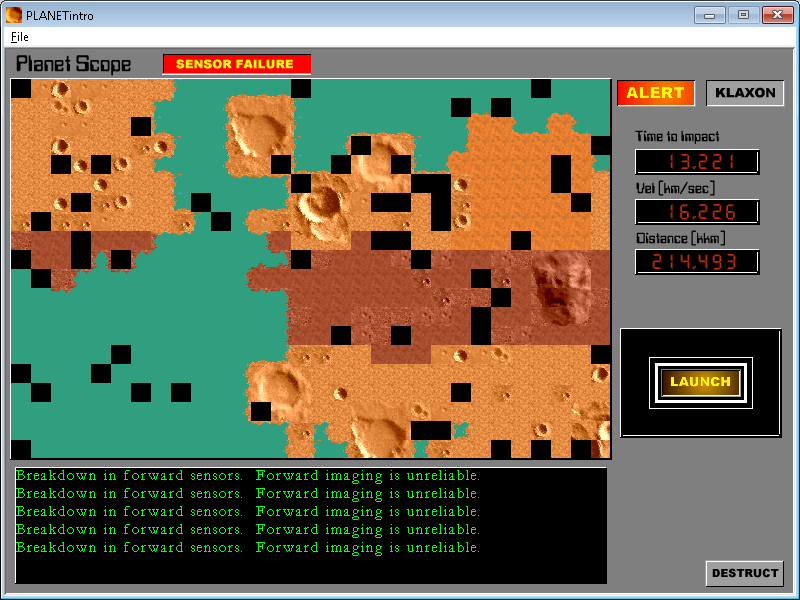 Re: Does anyone remember a 2D Mars colony simulation game from the 1990's? I vaguely recall a game like this. Can't remember its name, but I do recall playing something like this or this way back in the day... 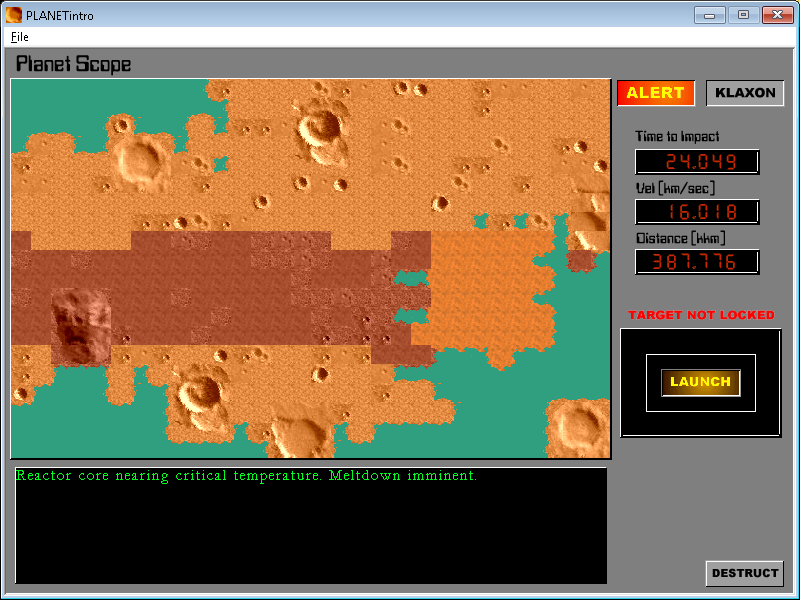 I think it was called Mars Colony Simulation. 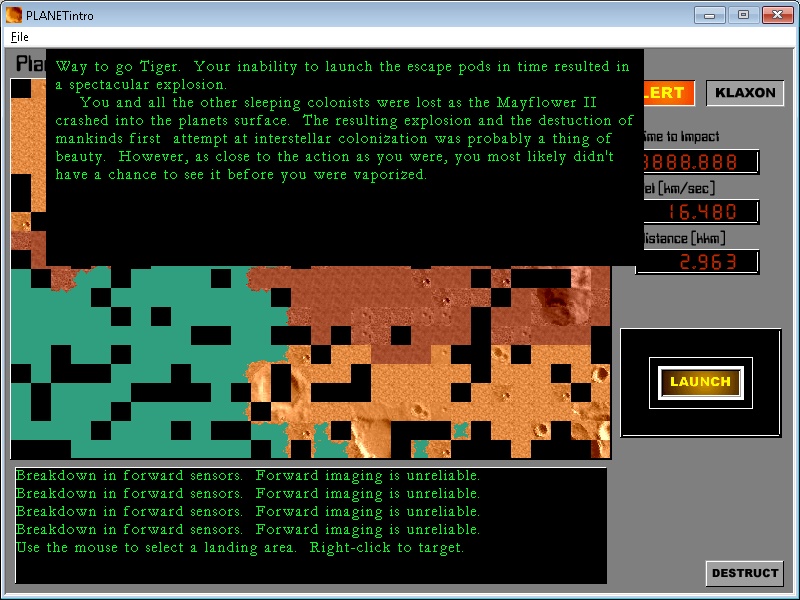 EDIT: When looking for this, someone mentioned in a forum thread on escapist forums about "trying to remember games from childhood", "Hungry Red Planet" that is from around that time period but unfortunately I couldn't find any screenshots for it. No, that is not the game because of the food pyramid. I would be interested in this game you're talking about too... hrmm. Gameplay-wise, it was very similar to Sol 0, but less cartoony. I like Sol 0 but it's very ... lacking... in many ways. When I'm back home (out on a business trip atm) I'll search around and see if I can find something. I've forgotten to include the list of games that I've eliminated. If you can provide a list of games you've eliminated it might be helpful to us. It's in the original post. Found it! 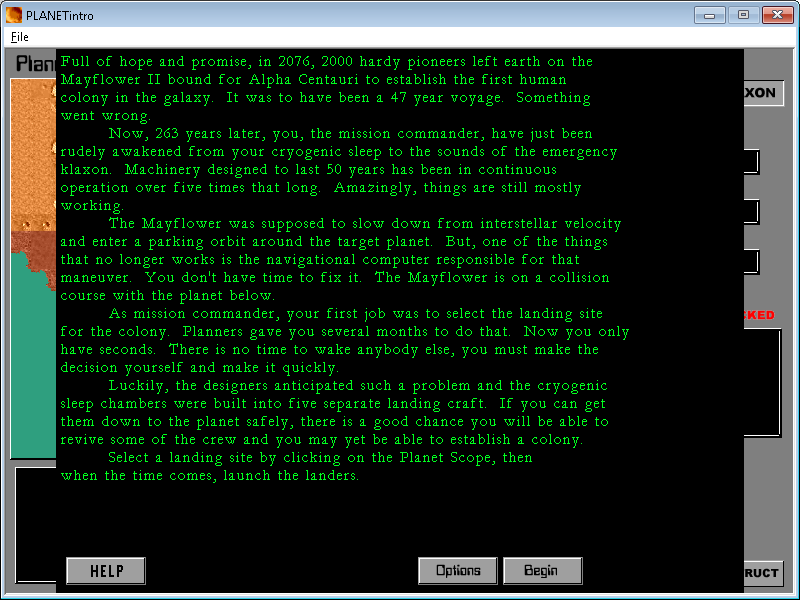 It's called Planet: The New Frontier or Ares by Kimbrosoft. Sadly, it will probably be very difficult to find the full version. Will keep an eye out for this one. I have a feeling that you're right, it will be very difficult to find this one. Seems like a no-name publisher that died years ago. The developer's website has been archived with a downloadable trial version that works. 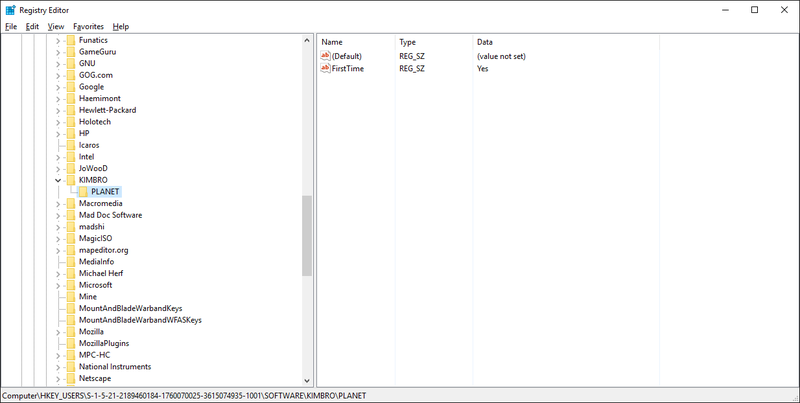 If you download and install it and want to skip the colony ship screen, run ares.exe. Well, looks like the trial version is just sitting behind a paywall... I'll try my hand at cracking it. If this company still existed I'd simply send them $10, not exactly a lot but seems we're SOL at the moment so cracking it is. Supposedly, the full game can be played by loading a saved game that has a date after 6.00. I believe the 6 represents year and each turn increments the date by 0.02. The save files have .ars extensions. I compared the differences between games saved at dates 1.00 and 1.02 in a hex editor to find out where the date value is located, but there are so many differences (Maybe I did something wrong?). P.S. If you're interested in viewing the technology tree, open file tech.ddt NotePad++. The format is human readable. This... is amazingly primitive. I can't get the intro or main screen to work at all and ares seems to sort of work. I'm not sure where the activation is but I have a feeling it just sets a flag in the registry. Got the into.exe to run in compatibility mode for XP. No luck with planet.exe.